China will speed up the opening of sectors including telecommunications, education and healthcare as part of a broader effort to further expand its opening-up, Vice-Premier Han Zheng said on Sunday. The country will continue to shorten the negative list for foreign investment and allow wholly foreign-funded businesses to operate in more sectors, Han said in a keynote speech at the opening of the annual China Development Forum. He also pledged that the country will make unwavering efforts to develop a world-class business environment and encourage foreign businesses to conduct research, development and innovation in China. "China will not halt its steps to work toward a higher level of opening-up, even in the face of protectionism and unilateralism by some countries. China will neither follow suit nor help them set up new barriers. There will be no turning back for us," he said. The vice-premier also repeated promises to the global business leaders attending the forum that China will continue to step up protection of intellectual property rights and forbid forced transfer of technology from foreign investors. "We will step up our efforts for IPR protection as well as law enforcement in various aspects, and establish a system of punishment for IPR infringement to significantly raise the costs of law violations," he said. 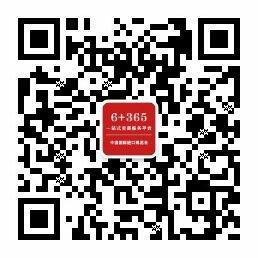 He also emphasized that more efforts will be made to improve the transparency and predictability of policies, adding that businesses of various types that are registered in China will be offered the same treatment in government procurement programs so that foreign businesses can enjoy better development in China. The country will further expand its 12 pilot free trade zones and support Hainan province to develop itself into a free trade port, he said. Ning Jizhe, vice-minister of the National Development and Reform Commission, said at the forum that China will deepen the opening of the agriculture, mining, manufacturing and service sectors. He said the nation will speed up the building of an index system to evaluate the business environment in the country based on international standards, adding that such a system will be piloted in some provinces and cities this year and be fully implemented nationwide next year. China is one of the most attractive destinations for foreign investment, with foreign direct investment hitting $135 billion last year, he said. Greg Medcraft, director of the Organization for Economic Cooperation and Development's directorate for financial and enterprise affairs, said China has adopted measures to encourage free trade, and free trade is what has traditionally driven economic growth in countries. "What is amazing about China is that now they are into the next phase of development and they are thinking about how they can be more efficient by having more private-sector competition against the SOEs (State-owned enterprises)," he said. Dieter Zetsche, chairman of the board of management of Daimler AG and head of Mercedes-Benz Cars, said he highly appreciates the commitment from the Chinese leadership to promote globalization. In addition, he said: "For us international delegates, this promise to further open up in an inclusive way is very encouraging. "Especially in the challenge of the international environment, we should all stand up for free trade and open markets." 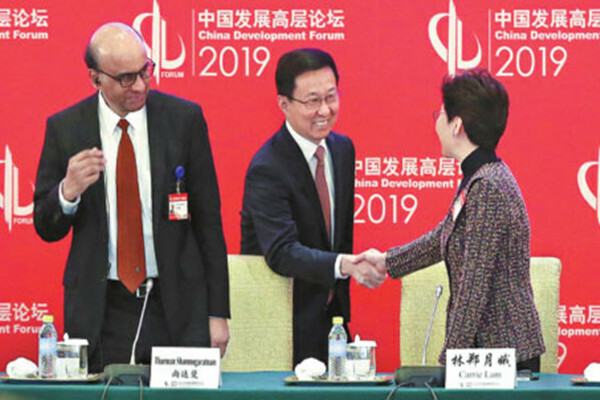 Vice-Premier Han Zheng (center), also a member of the Standing Committee of the Political Bureau of the CPC Central Committee, interacts with Hong Kong Chief Executive Carrie Lam Cheng Yuet-ngor (right) and Singaporean Deputy Prime Minister Tharman Shanmugara at the China Development Forum in Beijing on Sunday.